The times, they are a changin'. Since 1985 to 2007 the developed world has seen the sophisticated development of equity and fixed interest rate markets that has ensured that investments are aimed at a positive, growth future for the economies on the west side of the globe. All the skills and beliefs in markets have been consistent with that expectation. When the credit crunch came, the belief was that the powers that be would rectify matters and we would be back to the same rosy future once the hurdles had been surmounted. But here we are, ending 2011 and that rosy future has given way to an uncertain one where the very structures on which the rosy future had been built have stated to buckle and falter. Despite this, the adjustment by institutions has been slow to recognize these changes and the process of making markets face this new reality has been as slow as politicians have been to adjust their handling of matters. It's far more than 'denial', it is a refusal to change. The change needed is so fundamental that the careers and very way of life of financial manager would be at risk. Hence the poor efforts we see in changing the financial world. This is taking the path we walk in the financial world to a precipitous, almost cathartic point at an unquantifiable date ahead of us when we see pressures exerted to change that way we live our lives. Rather like a drought in a hot summer when the grass and bush dry out, the risks of fire are growing by the day. The drier the undergrowth the less the spark needed to start a most destructive fire. It is in this environment that we find ourselves now. It is affecting every single financial market in this global economy and requires every single portfolio and investment manager to recognize the scene and adjust investment values accordingly. Those who do this first will reap the largest rewards. Those who do not will find themselves way behind the crowd. This is particularly pertinent in the precious metal worlds. It brings us to the point in our series on 'changing ones portfolio to adjust to these days' to the question of, "Do I hold gold bullion itself or gold shares. As with all such questions the answer is not simple and straightforward. In the last 25 years gold mining shares have followed the way of most equities focusing on capital growth and through that, rewarding shareholders. In the last couple of years we have seen this change favor those companies that pay across dividends to their shareholders reflecting their profits as the gold price rose. This immediately points to a change that is now today's reality, that mining shares must reward shareholders with dividends. This implies that while a mining share is still an equity [but with a great product] carrying all the corporate risks that attend equities and suffering the rising costs that come with rising profits [the mining industry is susceptible to this in particular] each one must be carefully looked at before we can give a simple answer to the question in the title of this essay. In the earlier parts of this series we defined what to look for in a precious metal equity, so we assume you have read these. We highlighted the criteria that apply to getting the best out of these shares, so we will take a mining share that met these criteria as the basis for our comparison. Any other share that does not meet these criteria will clearly not perform as well, so will underperform both gold bullion and the shares that do meet our criteria. So let's look at the information we have on the performance of gold bullion and gold shares. 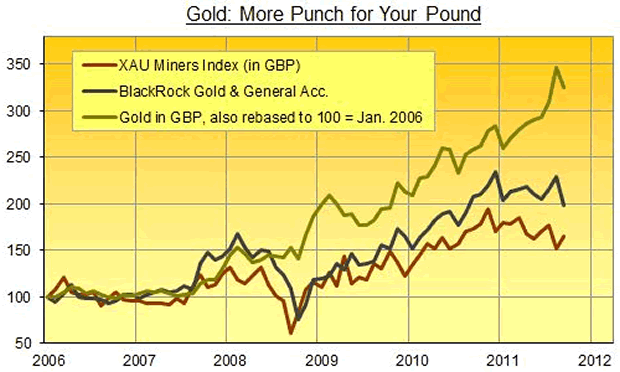 The chart below gives a direct comparison of a fund, the XAU index and gold bullion itself in the last five years. Bear in mind that the performance of the gold fund and the XAU index does not add the cash flow that comes from gold shares. However, when we add this back and the subsequent accruing of income on income the performance is enhanced. For the fund, we do have to extract their fees which lower the total return to that extent. Further to that, if we consider only the shares that meet our criteria, then their performance will far exceed both the gold fund and the XAU index. This tells us that there is a place for both bullion and selected gold shares in our portfolio. The right share will give an outstanding performance that can outrun gold bullion any day, but that performance comes from it reaching different milestones in time and its own growth. At what point does a gold share see the spurt in its share price. When an un-mined deposit turns from a gold resource to a gold reserve by "official" recognition [by a NI 43-101 confirmation] doubts about the size of the deposit are removed as are the unforeseen difficulties in mining that deposit. At this point the larger gold mining companies [really mining finance houses owning several mines] may well show a real interest in taking share in the deposit. Once a feasibility study is complete showing just how feasible the subsequent mining operation will be and the difficulties that may well face the mine and its costs, then the company is in a position to raise the finance to begin. This may come from the markets, the forwards sale of identified gold in the ground or from a mining company buying shares in the operation and bringing it to production. When the gold or silver price jumps, gold shares will follow to some extent but will, overall, wait until the average gold price for the period in question, has risen. After all it is from the cash in the bank that the company will pay dividends or not. Until then the gold or silver price may go either way. The prices of gold and silver themselves are not affected by any of the above factors. Their prices in the last six years have been driven by two distinctly different forces. On the one hand, gold and silver have reflected the fall of currencies. As confidence in currencies has waned, so the price of precious metals has risen. This is really a bear market in currencies and not so much a bull market I precious metals. On the other hand the demand base for precious metals has broadened and deepened across the world. 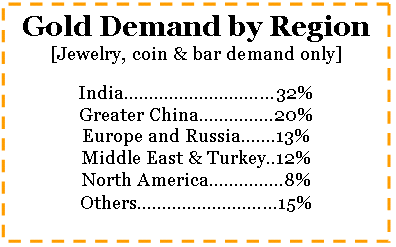 As you can see in the accompanying table the developed world now only accounts for a total of less than 20% of total jewelry, coin and bar demand, whereas the emerging world from Turkey eastwards accounts for somewhere around 80% and the flow of demand remains unabated. Take the entire amount of money invested in all the gold and silver shares on the markets of the developed world [far greater than the value of the direct gold and silver bullion holdings in value] and you can be sure that they have nit affected the gold and silver price by one dollar! Why are precious metal shares acting like shares and not the metal? One of the market changes over the last four years has been the propensity of gold and silver shares to act like the broad spectrum of equities in all markets and not to reflect the performance of gold or silver. This has troubled many mining shareholders as it appears that these shares have underperformed the precious metals themselves. At the end of the day, precious metal share remain equities with all their corporate risks and are treated as such by equity shareholders. We have seen the expectations of equities change in the last four years from the "earnings don't count" attitude to the "dividends are important". This has led to the underperformance of companies that fail to recognize this. Attitudes to the leveraging of such portfolios have also changed and become more conservative, further undermining the general performance of precious metal shares despite the stellar performance of the metals themselves. Developed world investors, because of their past in the financial world see shares as on a par with the metal. Their desire to achieve profits takes them to the shares almost naturally. But it is also in the developed world where pressures on the investors themselves can prove the heaviest. In 2007/8 when the credit crunch hit, these investors scrambled for profits and liquidity to meet the margin requirements suddenly thrust upon them, by the crunch. Gold and silver shares were natural targets, despite their continuing excellent fundamentals. Precious metal share prices suffered, disproportionately, as a result. Bear in mind too that the shareholders of precious metal mining shares are concentrated by far, in the developed and not the emerging world. They are therefore susceptible to all the developed world financial woes. In addition, the advent of the gold Exchange Traded Funds has impacted gold shares. A fund manager may well have allocated a percentage of his portfolio to gold and silver. Before the gold and silver Exchange Traded Fund all these funds went into gold and silver mining company shares. Today, these may well be split between the two. The net result of these factors is that precious metal shares, in general, have not performed as well as the metals themselves. We expect this to continue to be the case in the future too. By contrast precious metals themselves are global in nature. Gold and silver to a lesser extent attract global investors, a far bigger market than the developed world itself. 21% of global jewelry, coin and bar demand for gold comes from the developed world. We do not have these figures for silver at the moment. Because silver is much more an industrial metal and its production concentrated in the Americas, it is not yet in the same category as gold is, worldwide. However, demand for silver is global as it is considered the "poor man's gold". Precious metals carry far less risks than the shares of precious metal mining companies. There are no liabilities or corporate risks to the direct ownership of metal or shares that represent a specific amount of gold or silver. Gold and silver are at one and the same time, both cash [because of their enormous liquidity across the globe] and an asset, recognized worldwide. Precious metal shares can only be exchanged in a few developed world markets, with a far more limited liquidity. It is this difference that will always make gold and silver themselves behave far better than the shares themselves. To emphasize that point, the price of both gold and silver is directly affected by the amount of gold and silver that is bought, in whatever market in the world. A U.S. institution with its large financial firepower can affect the price of these metals. The current total tonnage currently held by the U.S. based SPDR gold Exchange Traded fund is greater than the entire holdings of the Swiss National Bank's. The purchase of this enormous tonnage directly assisted in gold's path from below $1,000 to nearly twice that at present. Copyright 2011 Authentic Money. All Rights Reserved. Julian Phillips - was receiving his qualifications to join the London Stock Exchange. He was already deeply immersed in the currency turmoil engulfing world in 1970 and the Institutional Gold Markets, and writing for magazin es such as "Accountancy" and the "International Currency Review" He still writes for the ICR.